Compact and bushy deciduous shrub with long lasting, upright, purple blooms in spring. Ideal for growing in containers. Awarded the RHS Award of Garden Merit (AGM). Habit: Compact and bushy. Can be grown as a small tree or shrub. Flowers: Large upright purplish pink buds and flowers appear in spring. Often fragrant. Usually open before the leaves appear. Aspect: Full sun or partial shade. Sheltered. South, west or east facing. Soil Requirements: Any normal garden soil. Moist but well drained. Will perform best if planted in full sun and sheltered from cold winds. Choose a well-drained site. Dig over the soil area before planting and add plenty of humus or well-rotted compost. Dig a hole large enough to take the roots fully spread out. Add a good general purpose fertilizer such as bonemeal. Firm in well and water thoroughly. Water regularly until well established. Ideal for growing in containers. Makes a good specimen plant in beds and borders. Can be pruned in midsummer once flowers have faded. Flowers are produced on last season's growth, so the only pruning necessary is to trim and shape. Do not prune back too hard. Apply a mulch of well rotted compost in the autumn. 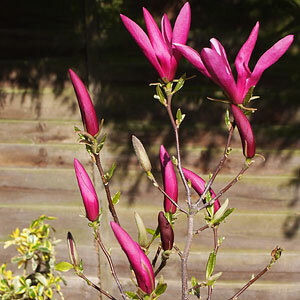 The best way to propagate Magnolia Susan is to take softwood cuttings in late spring or early summer. Cuttings can be slow to root so some bottom heat is recommended.